Respect Holy Cow - Do not Kill, Lets Veg please - !! Welcome to Sudarshana Sena !! Many, many, years ago there lived an old man and his wife in a village. The old man used to take his cow to the nearby meadows to graze and would bring her back home in the afternoons. He would have his lunch in the afternoons and then take the cow back for grazing and return home late in the evening, long after all the other villagers returned home. He would then put the cow in a cage-like enclosure in the cowshed. Thus the old couple passed their time peacefully for many years. The cow then told the old lady, “Dear old lady, you inform all the people in the village about this evil-spirited demon who is going to visit the village. Tell everyone to be careful. You light the firewood and place the biggest vessel you have at home, filled with water. When the demon enters your home, hit him with the broomstick and push him into the vessel in which the water is boiling. Quickly close the container with a lid. Do not open the container till the demon dies. After that open the container, put the demon in the centre of the village and burn the remains so no harm will come to anyone in this village anymore.” Thus the cow warned the old lady of the danger that awaited the old lady and the villagers, and the old lady did exactly as the cow had advised her. When the demon was dead she informed all the villagers of what had happened. The village people were very happy when they came to know how the cow had saved all of them. From that day onwards they all began to worship the cow as mother Cow [Gomatha].They also started looking upon the Cow as Goddess Lakshmi. The cow not only gives milk and milk products like butter, curd, cheese, but even cow dung is very useful as manure and as a disinfectant. It is also considered very auspicious by the people of the village. During the Diwali festival, villagers make a little ball of the cow dung and place a big marigold flower over it and decorate their homes with these cow dung balls. They also make garlands out of these flowers and decorate their cows whom they consider divine. They decorate the horns of the cow by painting them white or red and decorate their bodies with bells, flowers and other fineries. 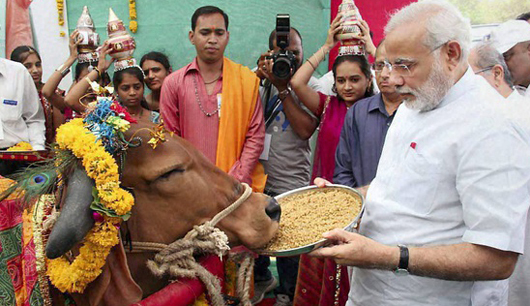 They make a special food with rice and lentils and, after offering it to God, feed the cows with it. On Diwali day, they have a special pooja called ‘Govardhan pooja’ when the young boys observe fast for Goddess Lakshmi and then offer pooja to their cows. When these boys return home after the pooja is over, the women of the house welcome them home with the traditional ‘arthi’ and then offer them the remaining special rice to break their fast. Later, they all pray to God and then distribute sweets to one and all. This is how the villagers celebrate Diwali by giving all importance to ‘Gomatha’ whom they consider as Goddess Lakshmi.